When I go the other direction, America to France, I pack certain things that I either can’t live without, because I haven’t found an equivalent, or I need (or like) to have them in my kitchen. For other room in the house, I stock up on unscented items. I, and my sensitive skin, and nose, aren’t fans of scented or over-scented items. (I once even saw vanilla-scented papier toilette. I like vanilla and all, but…) And yes, that’s me opening laundry detergents and smelling them in the supermarché aisles. I’m waiting for the day I get busted (or however you say that in French) for doing that. While I was packing my suitcase after a recent trip, I thought I’d share some of the things that were going back with me. I had a few books, snack-sized zip-top bags (which I once bought by mistake, but are great for small bits of things), and Tom’s toothpaste (I once ran out and used Romain’s toothpaste, which I found out was fennel – yuck…). I had the usual tangle of electronic cords and adaptors, which I finally organized by buying a cable organizer. I know, I know – Marie Kondo says not to buy organizers, but until they come up with a single cord and plug that works for everything (…please! And now there’s a movement to replace all our USB cords…oof…), I needed a better way to make sure I didn’t leave a cord behind, going in either direction. 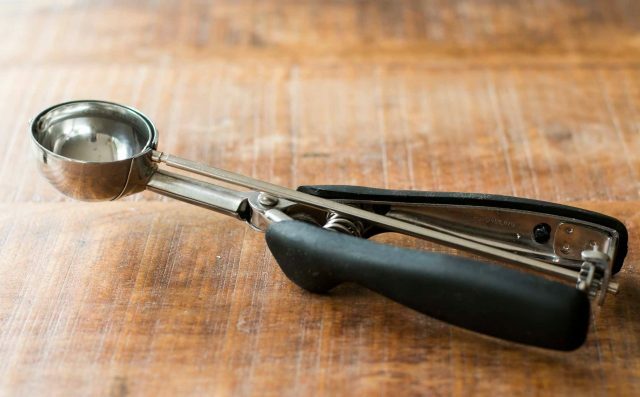 Spring-Loaded Ice Cream Scoop: The French love ice cream – what’s not to like? So why couldn’t I find spring-loaded ice cream scoops in various sizes for cookies? I didn’t get it until one of the clerks at MORA told me, “Because the French don’t make cookies like you do in the U.S.” Oops. Got it. He was right. While the French make cookies, they don’t really do cookies where the dough is dropped; they’re usually rolled and cut out. The size that’s available in France is used for scooping ice cream, like those restrained scoops at Berthillion, that make you want to order a triple, even though that’s très Américain. Sturdy Rubber Gloves: I love to cook and I love to bake. I do a lot of both, especially when I’m testing recipes. One thing I don’t love are all the dishes, a by-product of what I do. Consequently my hands are often in a sudsy sink and I wear rubber gloves because all the soap and hot water isn’t good for them. I’ve bought the regular or “cheap” rubber gloves for $1/€1, which only last a couple of weeks…if I’m lucky. The thick industrial-strength blue gloves that cost about ten times that, don’t wear out, but are so thick it’s hard to get a good grip on things. These neoprene gloves I found at Home Depot are perfect, and not too expensive. I think they’re worth their weight, in rubber. 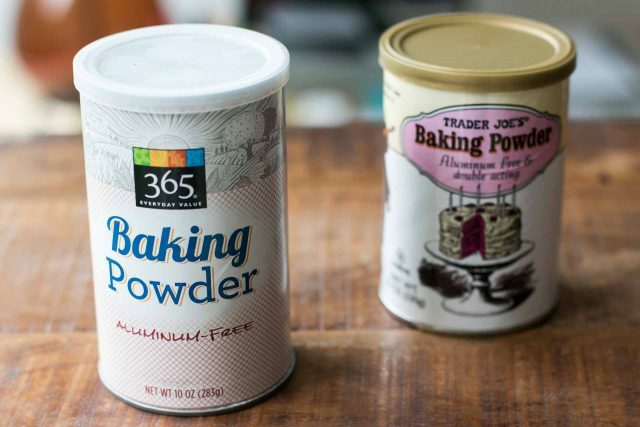 Baking powder: I get a lot of questions about levure chimique, French baking powder – but I don’t use it. I’ve familiarized myself with every other French baking ingredient but baking powder is my blind spot. It comes in little packets which are great for French recipes, which often call for “1 packet of levure chemique,” rather than a specific gram or cuillère à café (coffee spoon) measurement. I pick up tins of aluminum-free baking powder, which I’ve seen on the shelves at Le Grande Épicerie. But I find it easy to put a tin or two in my suitcase, just to be sure. 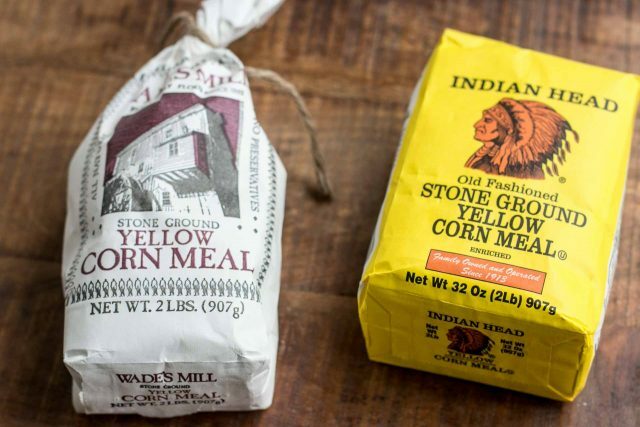 Stone Ground Corn meal: In parts of Europe, people do use corn meal – the Italians cook up polenta and the Basque make taloa, a tortilla-like flat bread – but in general, it’s hard to find stone ground corn meal for corn bread with the hearty taste of corn meal, like the bag I picked up in Virginia, on the left. I may try my hand at taloa with it, too. Dried fruits: I get terrific dried fruits in France; dates from Iraq, Tunisia and Jordan, prunes from Agen, and white figs from Turkey. I’ve been hooked on California dried apricots ever since I found out how to raid the box my family always had in the pantry that my mother poached and served with chicken and rice. I love the tanginess of the California ones, which are less-sweet than their counterparts from elsewhere. I also like the concentrated flavor of dried Black Mission figs, which go particularly well in tapenade. Hazelnuts and Pecans: I’ve not understood why we’re so close to North Italy, where spectacular hazelnuts are grown, but they elude me in Paris. The hazelnuts (and pecans) I often come across are not super-fresh. And there’s nothing worse than biting down on a funky hazelnut. Jacques Genin offered to sell me some hazelnuts, but since we’re frenemies – he once tried to strangle me – I decided it safer to bring some back in my suitcase. Rancho Gordo Beans: We get wonderful dried beans in France, although these heirloom beauties from Rancho Gordo really are special. The Christmas Limas (shown) cook up plump and meaty. For those who want to tackle cassoulet (such as the recipe in My Paris Kitchen), their cassoulet Tarbais beans are excellent, and more affordable. Chipotle: Americans love smoky flavors. 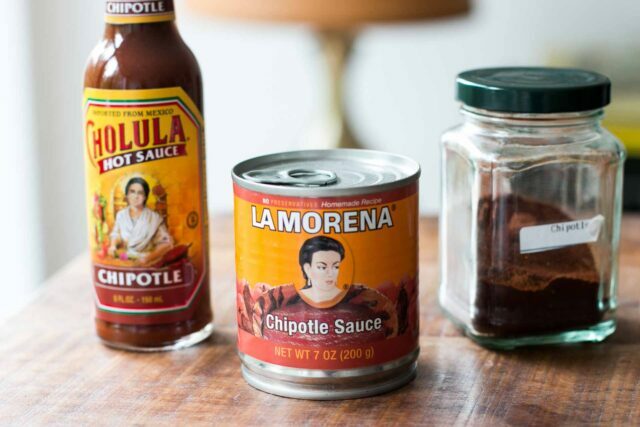 The umami flavor of smoky, smoldering chipotle is something that I crave, more than other chile sauces. And the French are getting into the action now, too, but I’ve not seen chipotles. You can buy dried chilis in Arab and African markets, but they don’t have the same flavor as chipotles. At the register, I get warned not to buy them because they are pimenté (spicy), which I have to explain that that’s what I’m buying them for. Believe it or not, I’ve never used the ones in the can, but saw David Leite make Chipotle Maple Barbecue Sauce from of them, and that’s on my docket for this summer. Non-Stick Spray: I don’t turn my nose up at this non-stick spray, well, it works really well for bundt and kugelhof pans. Some recipes just work better if the pan is sprayed with non-stick spray. We just need to deal with it. Curiously, the only place I’ve seen this in Paris is at G. Detou, sold as a product that’s geared toward professional cooks. A neighbor in Paris told me that spraying vinegar on wooden planters outside will prevent dogs from tinkling on them. Where do I find spray vinegar? Quarter Sheets: Anyone who has worked in a restaurant immediately knows what a half-sheet is. In cookbook lingo, technically, they’re jelly roll pans. But I don’t know anyone who has made a jelly roll since the late, great Marion Cunningham passed away. Flat, rimless baking sheets are what most people think of when you say “baking sheet.” But without the rim I find them hard to handle. (They don’t use the same half-sheet pan in France that they do in America.) And anyone who’s worked in the panic of a restaurant kitchen know something you don’t have a good grip on means disaster lurking ahead. However, in all those years, I never knew what a quarter-sheet was, until I saw them at a restaurant-supply shop in New York. Romain, my Frenchman, instantly bought one. On the next trip, I bought two. So funny–I pack many of the same things. My baking sheets are from the U.S. And 9×12/13 cake pans with covers. I also buy waxed paper (I find only parchment in France); lots of Mexican chiles and spices (dried powder, whole chiles, canned jalepenos and chipotles, tubs of mole); 200 fresh corn tortillas picked up at the tortilleria on the way to the airport (now in my freezer, well a few are left); barbecue sauce (husband’s idea); molasses and horseradish for making my own bbq sauce; super sturdy ziplock bags, especially in the really small sizes; hazelnut coffee; pecans (I find hazelnuts OK in Carcassonne); deodorant; Barman’s Friend; some kind of rust remover that worked great but probably shouldn’t have been on a plane; many, many books in English; jeans that fit….My suitcase is the maximum size and weight. For aerosol spray oil I use a manual pump sprayer. 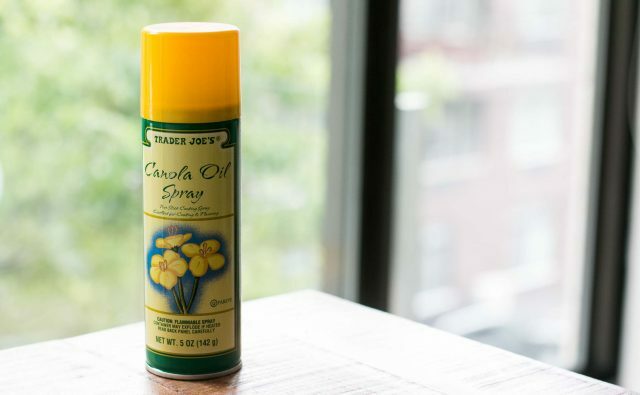 My choice of oil goes in, I pump the cap to maximum pressure, then voila— spray on oil! Not traveling to the US anymore, no family left there, I simply have to learn to do without many of those things or buy online. Funny how we get so used to certain items. 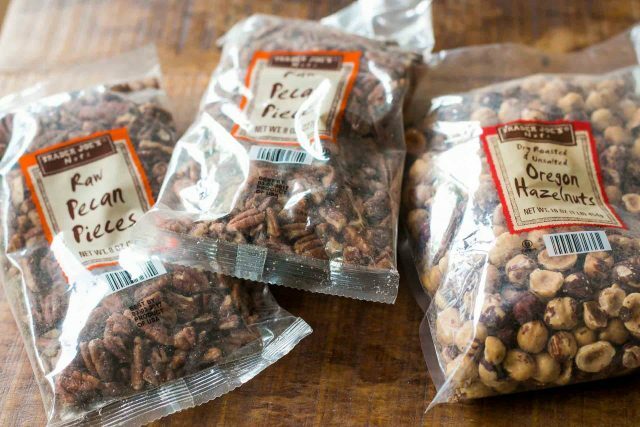 Pecans and hazelnuts? Look no further than les Délices d’Orient in the 15th. Forgot to add, their nuts are fresh and reasonably priced. I also find that the nuts on self service in the BIOCOOP are really good. Well at least in the Biocoop in the 19th. I have a really dumb question. Can you bring aerosol cans on planes? Do you put them in checked luggage? I don’t travel much! I assumed they were now verboten! A friend tried to bring me Pam kitchen spray on a plane and it was confiscated. I have found it mail order in France along with baking powder. protected by a cap or other suitable means to prevent inadvertent release of the contents. Individual airlines may impose stricter limits of course. I’ve found that sheet pans are not created equal, and cost certainly doesn’t predict performance or quality. Are there particular brands you like? When I lived abroad, it was the smokey chipotle flavors that I missed. Growing up with those flavors in both barbecue and Latin cooking, I didn’t realize how much I liked the flavor profile until I couldn’t have it! Jane: I generally go to restaurant supply stores and they have the sturdy ones, although places like Williams-Sonoma and Sur La Table also have good ones. If buying online, the Nordicware ones that I linked to in the post are good-quality. Charlotte: You can bring larger aerosol cans in your checked luggage. There are other types of aerosols that are permitted, but flammables are not – it’s the cooking oil that prohibits it. You can go to that website to check which aerosols are permitted. posted this below by accident. Many of my bring backs are the same. A few others: Crazy jane’s salt! Trader jo’s coconut sticks. Panda natural licorice. C. Howard’s violet mints. A”husband” pillow and a Bucky bra eye mask. It’s funny how we all have things that are important to us. I live in vietnam & some things are just not available. Many things are, however, they’re extremely expensive or just not good. I recently saw a single peach being sold for $20 USD! I’m going home in a few weeks so I’m starting to think about what I need. A lot of medicines as you just can’t trust what you get at the little corner market. Wow, that’s so true (craving Mexican more than many things). I find myself making/eating it more and more these days. That might not be a good thing ha! So true! When my wife and I lived in Japan, we craved Mexican food and did our best to recreate it with local ingredients. It was our go-to genre anytime we hosted other Americans for dinner. YES! In Japan, Mexican food is a complete non-starter. When we return to the Bay Area, we head first for a taco truck in Oakland. Then, we load up on dried chilies, dried beans, and masa. I’m making carnitas tacos for the “ladies,” who I’m sure will be shocked by how empty their lives have been thus far. I tried Clayton’s recipe for taloa several years ago and my comment was “like a cracker and hard!” – so if you succeed please write about it. You should get Neutrogena in Europe, although I don’t know whether it’s always frangrance free and how much the cost difference is. It’s pretty common in Germany though and seems available in France as well. Baking powder has been available in small tins in Germany for a couple of years now, which is a blessing I think. I’m German so I grew up with packages, but it works so much better with tins. I can’t say anything about whether German baking powder is different from American one, though. Just for fun. Things I bring back from vacation in France to Germany: Bouquet garni (ridiculously pricey in Germany), demi-bouteilles of champagne (the concept of demi-bouteilles apparently is lost on Germans), all sorts of shampoo stuff from Le Petit Marseillais. 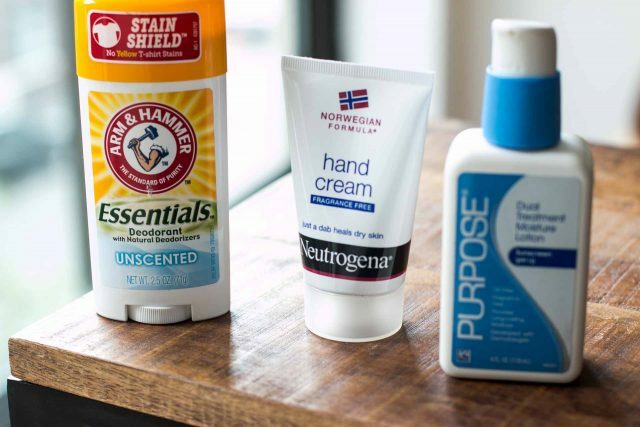 Neutrogena hand cream and baking powder are both easy to find in the UK, and no more expensive than the US. In addition to much of your list (my cosmetics/toiletry musts are different), I add heavy duty aluminum foil, cornstarch baby powder, TJ’s caramelized chocolate-covered coffee beans. TJ peanut butter (though it means that they always open my bag when checked in…. 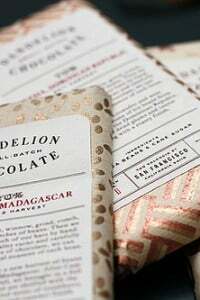 I am told it ‘reads’ like Semtex on the X-ray Also baking flour spray And coming the other way: For gifts — small bottles of olive oil from my village, Maldon salt from London, home grown lavender that I dry and then put in antique handkerchiefs tied with ribbon –sachets! Those Rancho Gordo cassoulet beans have been out of stock for, like, a year. I’m glad you’ve gotten it down to a science! Helpful list to consider for anyone moving to France from the US too. Use the chipotles in adobo sparingly, they packed more of a punch than I was anticipating. I love using the adobo sauce in my pot of very boring pinto beans. It really classes them up with flavor and heat. What I miss the most from France is my trusted vegetable peeler, the kind that doesn’t swivel. I was raised in a kitchen with this and cannot work with the american wobly type. Anytime I or any of my friends go to France, they have to bring me one or two back. Funny how a $2 item can change one’s life! You can buy the ones you like at trade shows, like home shows, etc. I spend several months of the year in Spain, in a town not far from Madrid. And while the town has several food stores, including an Aldi, a Condis, and a Mercadona, one thing I cannot find is sturdy aluminum foil. So I brought an extra fat (and heavy) roll, which should last me another couple of visits. Generally, though, I try to adapt to what the offering might be in the place I spend time in. I buy sturdy aluminium foil in Lidl. Also, their cling film is much better than the French flimsy stuff and now they have zip plastic bags all the time and they are not expensive. They do very good nuts too. It’s my go-to shop and I receive an email every week to tell me what’s in store. After having lived in Mexico for 20 years, one of the flavours I missed was the smoky chipotle. Imagine my delight when I found powdered chipotle at my local bulk store! You can make your own oil spray/mister bottles. They sell the empty bottles on Amazon. Just one question: how do you get bread, cheese, or anything worthy to be called edible into the US? After 30+ years in France, and traveling back and forth, I have lost numerous delicious sausages, cheeses, chocolates and more down a hatch at the airport, above what is presumably the customs officers’ lunchroom. I’ve all but given up. As for the return trip, coming from the South, grits and black-eyed peas sometimes come with me, and ALWAYS a bottle of bourbon. Check this list of what you can take back to the States. I was surprised that certain cheeses are okay. Meat of any kind is a no no, but I once took two huge strings of fresh Provencal garlic back. Fortunately there was a agricultural inspector right then in customs. He looked at it, asked where it was from and when I said France, he said fine. He hardly glanced at it once he knew it was from France. I live in Denver. I travel to Ireland once a year to see family, and yes it’s always Mexican foods that I miss. Last time I brought Masa Harina and red chile from Chimayo, NM. My sister and I (she used to live in SF) made chicken enchiladas with home made tortillas & red chile. Next time I’m gonna bring some fresh annaheim peppers & make chile rellaños. Yum! There is a Mexican food shop in Dublin owned by a Mexican woman named Lily and her Irish husband. Thanks so much! I’m going to Dublin in August. I’ll put it on my list. Just checked their web site. Now I know where to find chipotles— Boy, how Ireland has changed! You will really like the sorghum molasses/syrup. 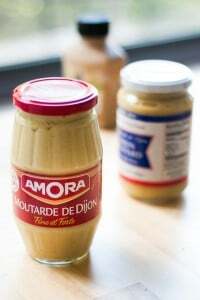 It is so much milder a flavor than regular molassas. I find it much tastier in my pumpkin pie filling recipe. Try cane syrup as well sometime. It’s what poor old Walter Cunningham poured over his dinner in “To Kill a Mockingbird,” and I don’t blame him. It’s like a very, VERY light molasses, but better. I’d miss goat’s milk cajeta, myself. Or whenever you (or someone you know) crosses the channel into the UK. Neutrogena is in most UK chemists and some supermarkets. Something I have not been able to find in Paris (and I have searched high and low) is hominy. Sometimes in the cold gloomy winter I crave posole and without hominy, posole is just not posole! A very good brand of laundry detergent I’ve found in France, that’s made in France, is Briochin. I use their savon noir laundry detergent and it’s great. It’s not super-widely available but in Paris, the ‘Simply Market’ stores sell it. David .. re chipotle: fab addition to so many things. But here’s the trick. Open the can and freeze in a plastic bag. Then when you need to flavor something a little or a lot, get out your microplaner and “zest” it into whatever. I also do with fresh ginger and it’s amazing… like ice that melts into your preparation. Enjoy! not sure if the sell by date on the chiplote. I will open an can and keep it in the fridge for about 3 months, never had any problems. Perfect to just blend some of the juice into some mayo and put it on a burger with pickled onions. That’s such a good idea-Freezing and grating the chipotle. I freeze it cause my recipes never call for all of it but zesting? yessss. I have spent years disgusted with myself for throwing out the leftover chipolte because I couldn’t use it up fast enough. Love this tip! Another way to use leftover chipolte is to blend it with any leftover mayonnaise to use as a dipping sauce. Not my idea but I can’t remember where I read it. Or, instead of freezing the canned chipotles in a plastic bag, freeze the chilies in a ice cube tray. Viola! Even though the can is small, there always seems to be just a tad too much for the recipe. Try oven braising a pork shoulder, chipotle, fresh oranges, condensed milk and spices for delish carnitas. I use sorghum instead of molasses in ginger cookies/cakes. It’s a little milder. As a child we ate it on biscuits and cornbread. I grew up about a mile away from a farm that grew sorghum cane and had their own press and boiler to concentrate it. Unfortunately it burned to the ground a few years ago and was never rebuilt. But I can still find it in rural Indiana. I loved reading this! One of my favorite places to visit in other countries is their grocery stores. As a cook/baker, I find it fascinating to wander through the aisles to see what is or isn’t available and how things are packaged. Japan in particular is fascinating–bread is sold in “loaves” of 5-6 thick slices and there is no such thing as a dozen eggs. I, too, love going into grocery stores in other countries and I always go. It’s also a good way to learn the language because they’re so visual, but it’s great to roam the aisles and see what other people eat or how they buy food. One thing that’s cute in France is that when you buy whole nutmeg, there is a teeny, tiny grater in the jar. I use speculos cookies which have more moisture than Graham crackers but have the same flavor. Generally I decrease the butter in the recipe, such as for a pie crust, if using those in place of the crackers but I don’t have an exact amount. David, what brand / where did you buy those lovely dried apricots on the photo above? After reading one of your posts which had a mention of California apricots I ordered some Fancy Blenheim Apricots on line from CJ Olson and they were just alright. I have yet to find the perfect ones. 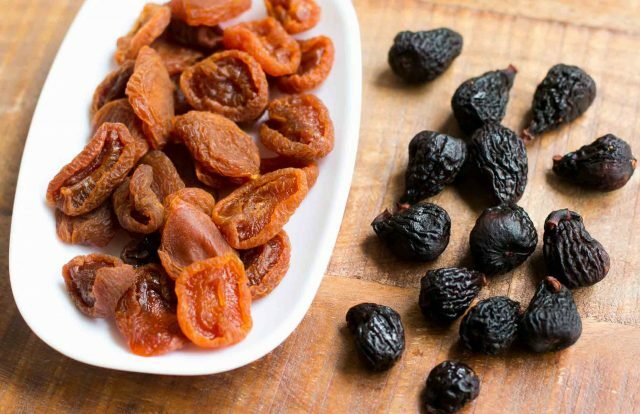 Trader Joe’s and Whole Foods have really good dried apricots – lots of flavor. The best California apricots are from Apricot King — they sell at farmers markets in the bay area & have a website. The dried apricots and apricot jam are both absolutely heavenly — really nice sweet-tart balance. I bring big bags to my family whenever I visit, and they disappear fast. 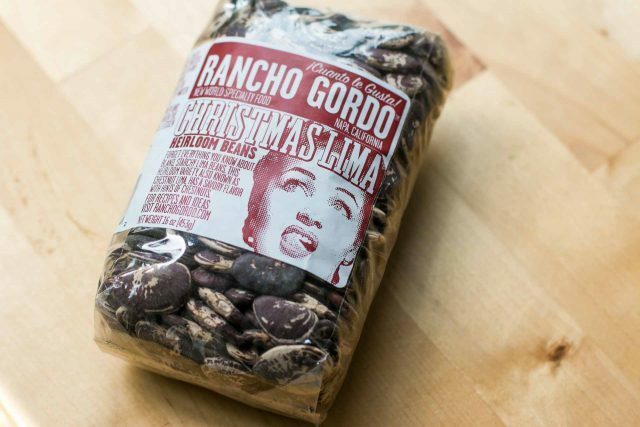 I live in Vancouver and I always load up my suitcase with Rancho Gordo beans when I’m in San Francisco. They are amazing! Tatiana: They’re from Trader Joe’s. Now i have to make a jelly roll…..
You can certainly get that Neutrogena hand cream in the UK – I’ve never looked for it in France, but assume it’s available. 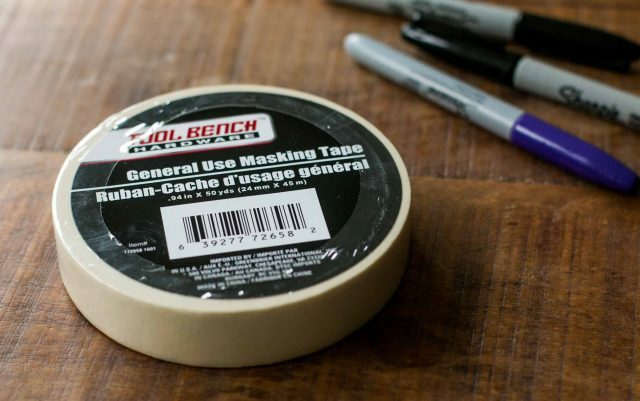 You can certainly get masking tape – if the “bricolage” department of your local supermarket doesn’t have it, then Bricomarché or its equivalent does. What I get people to bring me from America is wild rice, as it is so desperately expensive here, it’s like caviar…. also sometimes grape jelly, as you can’t get that here. (Incidentally, if a “jelly roll” is what I’d call a Swiss roll, they are still very popular here, either home-made – I make them on occasion – or bought). One may absolutely buy masking tape here in France, as David admits, but it is ridiculously expensive. So yup — I too bring some back with me from the US, much to the bemusement of my dad. But I am with you on the jelly-roll pan! I’ve taken spray cooking oil in my checked bag to my daughter in Paris without incident. Maybe I just got lucky. Hi, Living in Denmark I face a lot of the challenges you describe, and definitely strain my luggage zippers travelling back from the US. 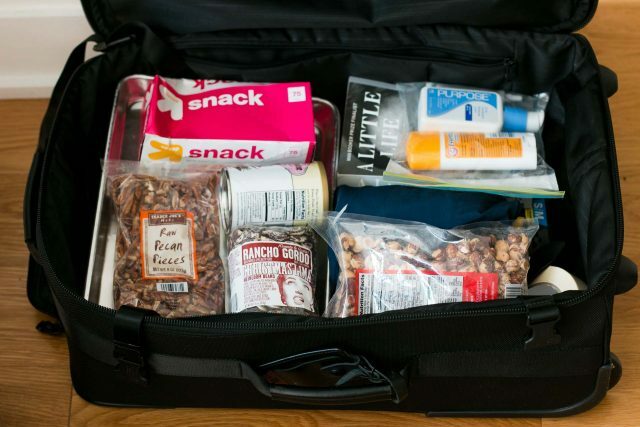 But, when I absolutely have to have something and can’t wait until my next trip I use a proxy shipper (shipito.com is my personal choice), and order my stuff (grape jelly, *good* maple syrup, Ziplock bags, etc) via them. It’s worked like a charm. Hope you find this tip helpful. E. Dehillerin sells a huge variety of spring loaded ice cream scoops. Not cheap ofcourse, but most any size you want. On the left as you enter. I agree they are the best for nice even cookies, made fast. How are you able to bring fresh French cheese and butter when you visit the US? It doesn’t go bad when traveling internationally like that? I made your recipe for olive oil muffins and wonder about the huge amount of olive oil (3/4C) Is that correct? There was oil leaked into the bottom of the pan and muffins were really loaded with it. Just wonder if that was your experience or if I got something wrong. Love your recipes in general. That didn’t happen to me. A number of people made the recipe, including here and here, and didn’t experience that. So perhaps you mismeasured something. Have you tried a day trip on the Eurostar to London to get many of these things? I have a friend who is a food stylist and he actually goes to London for the day to gather things since it’s easier. (I was surprised because there’s so much stuff in Paris, but he said it was easier to go there and gather everything…hmmm.) I, and others, order things from Amazon in the UK – they have things like Tom’s toothpaste (not fennel flavored…), aluminum-free baking powder, etc…but it’s a challenge to get deliveries in Paris so it’s easier just to slip them in my suitcase. I couldn’t live with out my smoky chipotle peppers packed in sauce from Central Market in south Texas. Really enjoyed your post today. Interesting reason for why the French don’t have the ice cream scoops for their cookies. 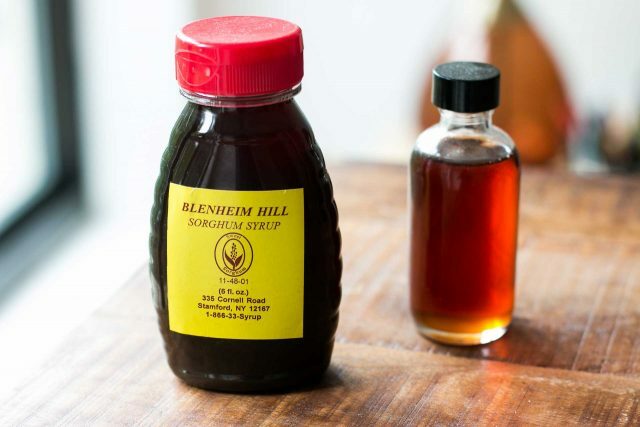 I also am interested in sorghum syrup after watching the Chef and the Farmer for the third time! I must be very dim, but I don’t quite see what cookies have to do with ice-cream scoops? I use the latter to scoop ice-cream out of the container in more-or-less spherical balls, which I then put in a bowl. How are they used with cookies? I do the opposite. I bring back my deodorant from France to the US. I’ve been using the same one for 15 years since I moved to Paris for 6 years and I swear it’s the only one I like and that works for me and it’s unscented. David, you must try it: Vichy Traitement Anti-Transparant 48H. (Available in scented and unscented). Pricey is you don’t shop around – sometimes as high as 12 euros for one roll-on, however, at CityPharma I can normally find a 2 pack for 9 euros. I have 8 stockpiled now and still go back to Paris 3 times in June. HOARDER! Yes, the prices on some of those things is certainly steep. €12 for a roll-on. I guess the secret is to stock up when there is a promotion. I use the La Roche-Posay sunscreen which is great, and around €12 in France versus $39 in America. Yes, and I have been told by several friends in the US, that the formula is different to the one in France. My friends constantly ask me to bring back that particular sunscreen – for both the price and formulation. I had no idea chefs use masking tape/Sharpies! What a good idea – a whole new world has opened up. Re the jelly roll pan: in the Commonwealth English-speaking world these are called Swiss roll tins (although they are usually slightly different in that the edges aren’t sloped back but are straight). So if you need more and are in the UK/Oz/NZ, that’s what to get! The “California apricots” of which you speak, are Blenhiem apricots. There is nothing like them, they are a treasure. They cannot travel. So if you don’t have a tree in your back yard, dried is the only way to experience them. You must have had them when you lived and worked in the Bay Area. They are magic. So have you read A Little Life yet? Did you like it? I have the same problem with cheap-o rubber gloves for doing dishes, but have found some nice heavier ones in the garden shop Truffaut (or possibly any garden shop) in France. I recently returned from two weeks in France with my 8th grade students. They took many different kinds of gifts to their host families (sees candy, wine, Cal Berkeley gear, Peet’s coffee). They all brought back bags and bags of carambar and haribo. Occasionally something else made it in (cheese, linens), but the candy they love but can’t get in the U.S. is most important. Always bring back loads for my nieces and nephews (and dark chocolate Michikos for my sis-in-law). We moved to Germany from Berkeley four years ago, and our list is very similar…although I’ve come to terms with the baking powder packets (I find if I use less and it works okay and most of the horrid metal taste is gone, and I make myself feel better by cutting open the packets and emptying them into a jar). Of all the food related items, we just plain miss Trader Joe’s. Masa Harina for homemade corn tortillas at the ‘Asia Shoppe’, along with Arm & Hammer baking soda. We’ve even found sharpie-like markers (yay, Edding! ), and masking tape at the paint shop next door. Ikea (in Germany, anyway) has a great assortment of zip-lock bags, so we have that sorted too. But Sudafed, the real kind that works, is always at the top of the US list, and despite the great coffee we have here (no really, we have some small, local roasters doing some wonderful things with coffee beans) I love a bag or two from Peet’s, and a bottle of Hangar One Buddha’s Hand vodka goes down pretty sweet too! I used to go to New Zealand alot. On the street, in front of Woolworths, they would sell ‘”American Hot Dogs” from one of those glass doored hot dog roasters. The American Hot Dogs were ultra skinny ( almost like a link sausage) and about a foot long and were a fluorescent hot pink color. While I agree, much of their “speciality weeks” have food that one probably wouldn’t buy (although they do sell the most delicious ice-creams from various countries), I do love Lidl – it is our nearest supermarket (50 metres from my front door!) and their fresh fruit and vegetables are so very good, with far fewer food miles on them than in most supermarkets, at half the price. 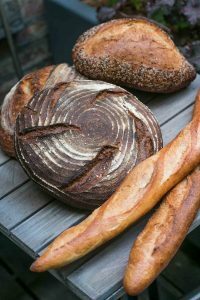 Plus their delicious breads and pastries, which probably don’t say anything to you as you live in a land of wonderful bread, but for us poor Brits, they are seriously wonderful! Even more oddly, I have seen canned hot dogs – in Brazil. They are disgusting. :) I wonder what a Brazilian fest would look like… Probably something like powdered pineapple inverted cake (sorta American that I have never seen in Brazil) and canned shrimps (something canned that we aren’t sure is even possible). Wouldn’t that be fun? I’m planning my 1st trip back to NJ in 8 years (Nov) and began jotting “wanna haves” months ago. A trip to Penzey’s, when I’m in VA should do the trick, but I “need” Mrs. Wright’s copper polish, e.g., and lots of cooking tools, etc. Zip-locs are always a must and my laundry line is often lined with drying bags vs. clothes. (Great idea about waxed paper—I sometimes miss that and hadn’t put it on the list.) Sadly, they’ve cut the free luggage allotment from one case to two for checked baggage. Darn! But I’m lucky that I know a number of Brits who come here having maison secondaires and they’re always willing to keep me stocked up on things like chipotle paste, tea (the tea in France is so much weaker), vanilla paste, the occasional Seville marmalade, and Carr’s water biscuits, which, even now that they’re back up and running, are still difficult to find where i am. Wish I knew some Irish folks. Just can’t get that incredible wholemeal bread outside of Ireland! David, several others have mentioned bricks for spray bottles for white vinegar. I keep one under the kitchen sink and one in the bathrooms for quick cleanups—it’s fab with a microfiber cloth for the hard water marks on my stainless steel sink. I also use it in lieu of fabric softener (which is toxic) as it pulls the soap out of the fabrics—great for sensitive skin. This post really resonates with me because every summer I go to Sardinia. I always bring back the same list of items (Mirto, bottarga, Molinetti cookies, ginseng espresso,etc) and whenever I go there I bring items from home that I never seem to find there (baking powder, certain vitamins, etc). For my trip back to Japan I always pack an extra bag with the same nuts and seeds, baking soda, baking powder, TJ Montmerency dried cherries, and some good chocolate. Once I had a cashier at TJ look at my basket and ask if I had a health issue. When I lived in Korea, I would mostly take back food items such as smoked paprika, dried porcinis, etc., but I also had to take back a microplane zester and, oddly, a slotted spoon. Never saw a slotted spoon in Korea. Love your newsletter. Tips re your latest: why don’t you keep a pack of surgical latex gloves – am sure you can get them in Paris – we get them in Israel in the supermarket. They fit like a second skin – I use them when I paint, draw, cook, make salads etc – but not for dishes. My dishes go in the dishwasher. Apricots – try a health or organic store in Paris and ask for apricots Uzbeki (Uzbekistan) they are slightly tangy tart and just divine (dried of course). Before I shipped all my worldly possessions to my home in rural France, I went to Costco and bought a lifetime supply of ziplocs in all sizes (I agree, snack size is really handy), two gigantic rolls of plastic wrap, a humongous roll of aluminum foil, another big roll of heavy-weight aluminum foil, several giant boxes of unscented dryer sheets, bottles of liquid smoke, masa harina, molasses, copper polish, a few jars of mole, that almond-maple butter that comes in little packets, and a big bottle of Tylenol. And jar after jar of my favorite skin cream. I wish I’d also shipped a couple grapefruit spoons and a lifetime supply of my favorite undies. My French father-in-law loves grapefruit so I bought him some grapefruit spoons, the kind with the little teeth on the end. Re: hazelnuts, it’s funny because one of the things I bring back from France to the US is roasted salted hazelnut packets. Reynolds wrap heavy duty foil and Saran “premium ” wrap (film alimentaire en français) so much better than here, and I am well stocked thanks to you and to some very thoughtful friends. or a vanilla genoise rolled up with fresh berries and whipped cream. Super easy but look sort of special. Then there’s always the Buche de Noël (the “yule log” Christmas cake)… That needs rolling up, right? And the small jelly roll pans you bought are great for making bar-cookies, such as lemon bars. Going from France to the US we regularly bring back cans of duck confit and Negrita rum that we use for baking (does anybody know an equivalent available in the US?). I gave up masking tape. Instead I mark glass jars and plastic with a sharpie marker and then remove with a spritz of rubbing alcohol I keep I in the kitchen in a tiny spray bottle, the kind meant for cosmetics. It works great and you don’t have to clean off tape sticky residue. David, please tell me about the poached apricots your mother served with chicken and rice. Sounds delicious. You stopped me dead in my tracks with that sentence. Thanks very much. We have an experimental olive farm in OR. 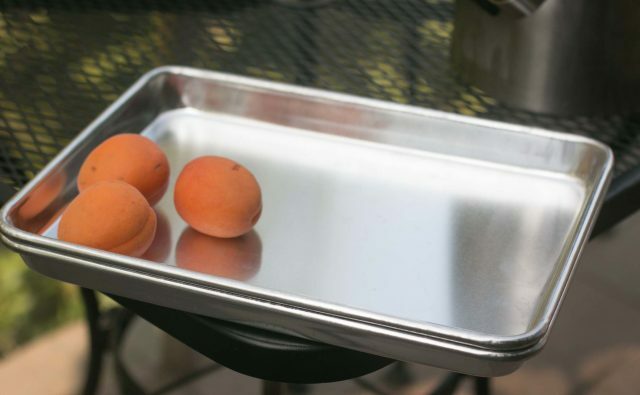 When we have friends come out for an informal outdoor lunch or dinner among the olives, I use quarter sheet pans as both “plates” and “trays,” for guests to carry their lunches outside. Works very well, and nothing rolls or falls off as might happen with plates. If there is something that requires a plate or bowl, I use half-sheet pans as trays. Sturdy! You are such a good writer. I read every word. Friends gave me a fill-it- yourself atomizer for coating pans with oil (like canola oil.) I’ll find a source and post it when I find it. I hope you enjoy the cornmeal from Wade’s Mil in VA. Their products are excellent! Interesting read. Australia’s not the only one: Europe is careful of its plant health too so it’s illegal to carry beans and seeds into Europe/France. Hopefully yours only ever made it into soups. They looked great! Did you love A Little Life? It’s the first book I sobbed over in years and years, stayed up several late nights to finish it. I always bring back several bottles of Mexican hot sauce, Scotch Brite scouring sponges, natural lip balms (Dr. Bronner’s is nice,) Crest Glide floss, and something unusual (to Europeans) from Trader Joe’s (I’m from Cali) like peanut butter pretzels. Reynolds Release foil in regular and heavy duty versions is essential. I am required to be bring a suitcase full of it back to France each time I go for French family members who have become hooked on it. I once brought a whole roasted Chinese duck from the Ranch 99 back from San Jose to Montana. Wrapped in foil and ziploc bags in my carry on. The TSA guy laughed when I said “but it’s not a gel or a liquid!” We’re not a foreign country, but there’s no good Asian food or supplies, so when I’m in Seattle or San Jose I stock up. I hope you enjoy a Little Life. I loved it but it made me cry a lot. I love this thread! I have lived in three different continents outside the US for over 20 years. Here is my typical from-the-US food list: Penzey’s double-strength vanilla and almond extracts (by FAR my primary needs), ancho chili, fenugreek leaves, garam masala, crystallized ginger, pine nuts, harissa, lavender buds, unsweetened chocolate, cranberries, pumpkin pie spice (so uncool now…), parchment and wax paper. When I was living in China I would stock up on the same things to bring back. Many of the lotions/face products had bleach in it and it horrified me to use skin whitening products when I’m already white enough as it is. I also brought nuts and dried fruit back even though I could find them there. My list also includes maple syrup, as I’m from Vermont. Sure, you can get it in France. But only tiny little bottles from Canada that are super expensive. Not the gallon or half gallon containers I’m used to. Of course, when I lived in California, maple syrup was also always on my “bring back with me” list, so it’s probably only helpful when traveling to and from the Northeast US. So glad to see this list of permitted foods. Now if I could just find a comparable list for foods permitted into Mexico. It’s hit and miss sometimes, but the worst that can happen is that a special ingredient is confiscated. Speaking of sorghum syrup, have you tried date molasses? I bought some in a local Arab grocery store. They also have pomegranate molasses, which I used to make your butterscotch sauce; it was tangy but still had that rich butterscotch flavor and it is heaven. David, I absolutely LOVE~oops :) your website! Such beautiful photos, recipes, fun and interesting stories. I made the maple chipotle bbq sauce you had a link to and it was wonderful! Gets better after a few days developing it’s flavor. Dont bother with the General Use masking tape. The adhesive breaks down and leaves a residue on everything and the beigeness can go all translucent. The adhesive is probably toxic as well. Living in France, the south, and northern CA for 20 years, I am a great fan of Mk Fisher the original “foodie” writer. I discovered the best food artist David L. By searching for a French lemon tart recipe. I found a recipe book from chez Panisse fruit recipes, and voila discovered coincidence, serendipity I love your recipes the adventurers bread etc. Agree with all the commenters who miss Mexican and Latin American food when they are away! A great way to use the canned chipotles is to blitz the whole can into a puree in the food processor, then freeze it in a shallow container. It never freezes rock hard, so I find I can usually scoop or carve out the amount I need straight from the freezer. Lasts for months this way! Thank you for the glove recommendation. I love my dishwasher but sometimes hand washing is necessary. Dish gloves are always too flimsy or too thick. 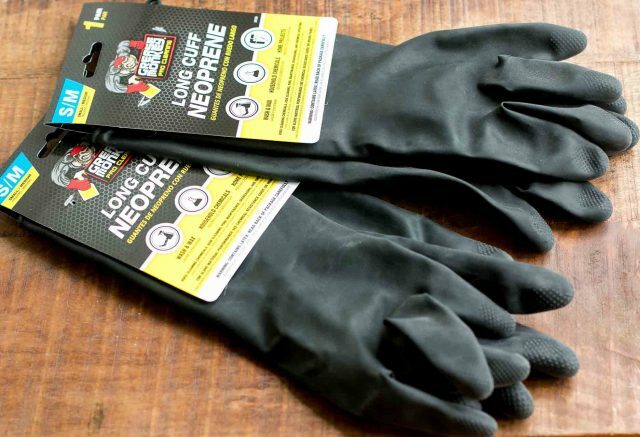 The neoprene gloves are perfect and reasonably priced. David, It’s time to bake a jelly roll! My family loves them throughout the year. Homemade jams are so wonderful tucked into a light cake with maybe a dollop of cream. Or a simple puree of fresh fruit. And the heavy pumpkin roll my mom makes completes Thanksgiving desserts.